Does your company’s warehouse system comply with current fire codes or insurance regulations? Do you need a stable base capable of sustaining heavy loads? The Surplus Warehouse, Philadelphia’s leading used and new material handling dealer, features a wide variety of used wire deck solutions. Our inventory of used wire mesh deck and wire decking is easy to install and is basically maintenance free. Call The Surplus Warehouse directly at (215) 755-7000 or email us at sales@surplusrack.com and we’ll meet your needs with the speed you can rely on. Wire decking solves problems that were previously unavoidable. Originally plywood or particleboard was used for storage racks, which functioned well but were economically and productively inefficient. Today, used wire decking has replaced plywood and particleboard and is available in powder-coated finishes or hot-dip galvanizing. Both finishes offer unique features that enhance the performance of wire decking. The properties of wire alone make it very long lasting and durable. In fact, wire deck may save you money on your fire insurance costs by reducing the overall fire load in your warehouse and increasing the ability of water to flow through your storage system. Used wire mesh decking is typically galvanized or powder coated after it has been welded to provide long-term resistance to rust. Used in areas where businesses store bulky containers or heavy objects, wire mesh makes the workspace look bright and professional. Wire mesh features a grid pattern, which makes it easy to see where everything is stored when you are looking for a specific product. In warehouses that lack sufficient light, wire mesh decking proves useful as light will transfer through the wire mesh giving you a clear view of what is stored on the deck. Types of Wire Deck – Click here to see different types of wire deck. How to Measure – Click here to learn how to properly measure for wire mesh decking. 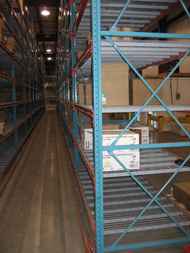 If you are in need of high-quality commercial and industrial shelving systems that are guaranteed to withstand the rigors of use, than look no further than The Surplus Warehouse, Philadelphia’s leading supplier of material handling solutions. To match the demands of our client base situated throughout the Northeast corridor in New Jersey (NJ), Pennsylvania (PA), Maryland (MD), and Delaware (DE), we are constantly expanding our inventory of both new and used racking and shelving varieties, from teardrop pallet racks to wire mesh decking. Give is a call at (215) 755-7000, email us at sales@surplusrack.com, or visit our facility to inquire about our inventory.